A KC-135 Stratotanker being taken apart for inspection at Fairchild. In a Fairchild Air Force Base hangar, a gray airplane sits with its wing flaps extended and the skin torn off part of its body. Country music echoes throughout the 75-year-old building — the oldest building at Fairchild — as Sgt. Derrick Brooke tells the crew to act natural in front of the camera. "Oh, I gotta do my hair!" laughs one member of the crew. The plane is a KC-135A Stratotanker. The airmen inspecting it are cleaning some corrosion, which isn't uncommon on these planes. But this tanker, more than 50 years old, is actually one of the newest KC-135s in the U.S. Air Force fleet. It's been modernized throughout the years, and it's had at least three different types of engines. The goal, says Brooke, is to make these planes live to 100. "We're trying to milk another 40 years out of these, essentially," he says. 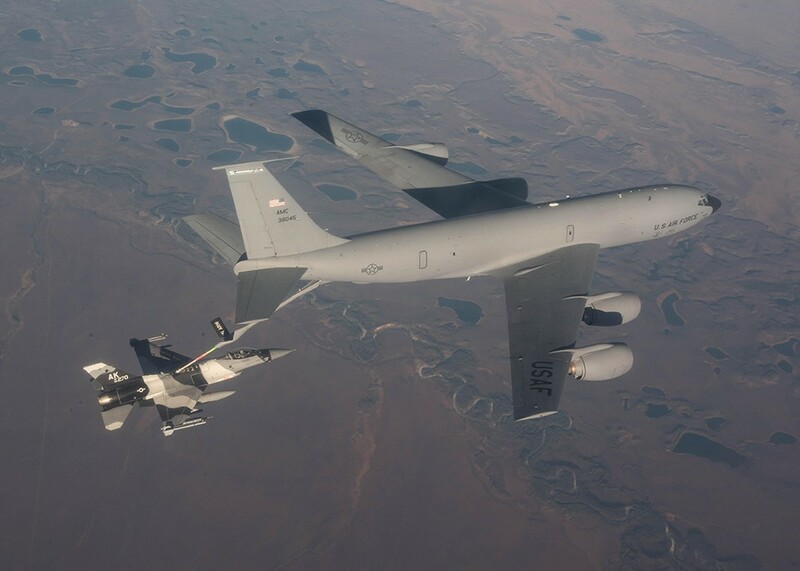 Fairchild, the largest tanker base in the western United States, was selected earlier this year to take on 12 more KC-135s, bringing the number of tankers on the base to 56 by 2020. It will then be the largest tanker base not just in the West, but in the entire country. The news of the new tankers was mostly sold as a win for both Fairchild and the surrounding community. But some see it as bittersweet: The KC-135 tankers were announced only after Fairchild was overlooked for KC-46 tankers, a more efficient and modernized aircraft than the KC-135. In the coming decades, the older KC-135s will be phased out of the Air Force. It makes some community members nervous about Fairchild, as the Trump administration pushes for a new round of base realignment and closures. The base has evolved throughout its 75-year history to the benefit of both the military and the local economy, yet the future of the base still seems uncertain. "When the Air Force is done getting rid of the KC-135 tanker, then what's our next mission?" wonders Spokane County Commissioner Al French. "What's the lifeline to keep it a critical part of our national defense?" Today, the operations at Fairchild allow the Air Force to have true global reach, says Colonel Ryan Samuelson, the current commander of Fairchild's 92nd Air Refueling Wing, which provides the fuel needed for missions across the entire world. At any given point, half of the 44 tankers currently stationed at Fairchild are somewhere else, he says. "Sometimes they're launching here to go out to other missions, and they won't be back for two to three months," Samuelson says. The Inland Northwest location provides the most direct route to operations out in the Pacific, and there are no other large tanker bases in the Northwest. It's away from natural disasters (aside from the Mount St. Helens eruption in 1980). If there were any emergencies at the Air Force bases on the west side of the state, those planes could stage at Fairchild. Yet this represents a significant change from Fairchild's past role in the nation's defense. In 1942, it was called Spokane Air Depot and served to repair damaged aircraft. It wasn't named Fairchild until 1951, after Air Force Vice Chief of Staff Muir S. Fairchild, a Washington native who died a year earlier. During the Cold War, Fairchild was home to bombers and intercontinental ballistic missiles. In the 1950s, there were three crashes at the base. The last one, in September 1958, killed 13 crew members when two B-52 bombers collided. That was also the year the first KC-135 Stratotanker arrived; it was called the "Queen of the Inland Empire." During the Vietnam War, Fairchild tankers and bombers flew out to join the conflict. After the war, Fairchild's mission transitioned back to strategic deterrence, ready to respond to any attack, as more KC-135 tankers came to Fairchild. Decades later, in 1994, the bombers started to be phased out from the base in favor of the tankers. The last B-52 at Fairchild crashed in June 1994 while practicing for an air show, killing four airmen. With no more bombers, Fairchild officially no longer was home to the 92nd Bombardment Wing, and it was redesignated as the 92nd Air Refueling Wing with its KC-135 tankers, which became the largest tanker wing in the Air Force. It was the first time in 47 years that there were no bombers at Fairchild. Samuelson says that's when Fairchild, along with the rest of the Air Force, saw what he calls the beginning of a "drawdown." When Samuelson joined the Air Force in 1993, he remembers there were more than 550,000 people in the service. That number has since dropped by more than 200,000. At the same time, the number of tankers at Fairchild slowly dwindled. "That drawdown of the base was very much in line with the drawdown of the Air Force as a whole," Samuelson says. Many saw the decline in KC-135 tankers in the 1990s and 2000s as evidence that something was wrong; that Fairchild would be the target of the Defense Base Closure and Realignment Commission (BRAC) and shut down. In 2005, 24 bases were closed due to BRAC; Fairchild survived. Yet the fact that Fairchild was denied the new KC-46A tankers in recent years left a bad taste in the mouths of local lawmakers. In 2013, Fairchild was listed as a "reasonable alternative" for the new tankers, which were sent to McConnell Air Force Base in Kansas. In January of this year, two other bases — one in New Jersey and the other in California — were listed as the preferred bases for the tankers. Rep. Cathy McMorris Rodgers and Sen. Patty Murray, who helped push for Fairchild to be chosen, blamed the selection process itself. Murray said she was "outraged." And McMorris Rodgers tells the Inlander that she continues to have questions about how Fairchild was not chosen. She says the process didn't recognize that Fairchild is a very strategic location. "I don't believe the criteria really provided for that to be recognized," McMorris Rodgers says. So McMorris Rodgers, along with Sens. Murray and Maria Cantwell, wrote to the Air Force in March, urging that Fairchild be chosen for the new KC-135s, after losing out on the newer KC-46s. It worked. By 2020, Fairchild will return to its status as the largest tanker base in the Air Force, with 56 KC-135s on base. KC-135s are known as the gas stations of the sky. "After years of watching the base get smaller and smaller, with concerns about the long-term health of the base of this community, I think we're up on a growth pattern that is very well sustainable," Samuelson says. Still, that didn't alleviate all concerns about Fairchild's future. Heightening tensions for the base, the Trump administration has pushed for a new BRAC process that could shut down some bases, though the House rejected the effort weeks ago. Even if there were more BRAC closures, McMorris Rodgers remains confident that Fairchild will stay. The tankers at Fairchild now, she says, are "never going to be reassigned." As for the KC-46 tankers, she remains optimistic. "It is a matter of time before Fairchild will be getting the KC-46s," she says. Others aren't so confident. French says that since Fairchild was second in line for KC-46s four years ago, and this year was third in line, it may be on a downward trend that doesn't bode well should a BRAC occur. The BRAC process, he says, is a "political decision" that he feels has little to do with what the Air Force does or doesn't want. "Everything has to do with political decisions and funding policy. Because it's a political decision," French says, "a closure can happen at any time." Samuelson's first exposure to the Spokane community, before he became commander at Fairchild last year, came in 1999 for the Air Force's survival training. The Air Force's Survival, Evasion, Resistance and Escape (SERE) training school, which teaches around 20,000 people per year, is located at Fairchild. "I came through the school here and they gave me a day off, and I got to go downtown and eat at an incredible restaurant," Samuelson says. "That was my first exposure to Spokane and I loved it." Having a base like Fairchild located in the Inland Northwest provides the Air Force with a unique advantage for its survival school, where airmen learn how to survive should their aircraft go down, or should they become prisoners of war. The Air Force chose Fairchild for SERE training because of its access to a variety of terrain. Go east to Idaho, and airmen can get trained on a mountain. Go an hour or two west, and they're trained in a desert. Fly over to the Olympic Mountains, and there are near-rainforest-like conditions. "The capabilities that the survival school uses can only be found here in the state of Washington," says Samuelson. "The Inland Northwest has a very unique, specific climate that makes SERE training up here absolutely ideal." Just as Fairchild benefits from being located in the Inland Northwest, community leaders say the community benefits greatly from having Fairchild there in the first place. It's why politicians advocate so hard for new tankers that they feel would benefit Fairchild. Todd Mielke, CEO of Greater Spokane Incorporated, points out that businesses and citizens donated money to buy the land Fairchild sits on back in 1941. It started a long partnership that the business community would have with the base. Preserving it comes down to a simple equation, Mielke says. "More planes equals more staff, equals more capital investment," Mielke says. "That equals less chance of a closure or reduction and effort. So that's been our pursuit." That directly helps the economy too, he says. Fairchild is already the largest single-site employer in the region which includes Eastern Washington, North Idaho, western Montana and northeast Oregon. Mielke says that last year, Fairchild conducted $40 million in construction projects on the base, using local contractors. By the time the 12 additional tankers come to the base, there will be about 400 more active duty personnel on base, along with their families. "They're not just doing their job protecting their country — they're part of the community. They go to restaurants. They pursue entertainment. They buy houses. They have kids in our schools," Mielke says. Many see another part to the equation in preserving the strength of the base: preventing development from encroaching on base operations. In recent years, Spokane County has been in the process of shutting down trailer parks in the Fairchild crash zone and moving the residents to low-income housing nearby. More visibly, the Spokane County Commission, including French, has opposed the development of a Spokane Tribe casino, alleging that it threatens Fairchild. The Air Force has officially remained neutral on the development, though it had some concerns related to air traffic around the casino. There's been no evidence that encroachment concerns played any role in decisions about Fairchild potentially taking in new planes. Yet the support hasn't gone unnoticed by the Air Force, says Samuelson. "I don't say this flippantly," Samuelson says. "I'm third-generation Air Force. I've been in the Air Force for 23 years. Fairchild has by far the most incredible community support I have ever seen." 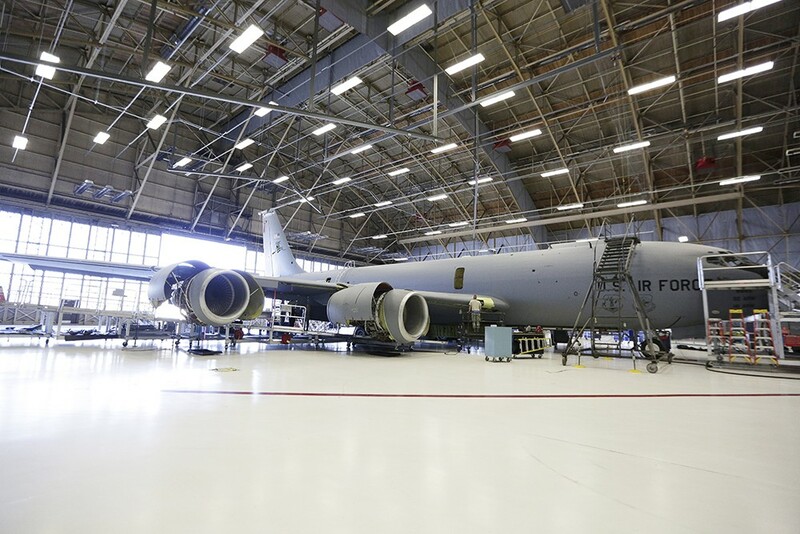 Fairchild is continuing to improve the base in a way that will make it valuable even after the KC-135s are phased out in the coming decades. Samuelson says that's a benefit to both the Air Force and the community. For more than 50 years, the KC-135 Stratotanker has refueled aircraft for the U.S. Air Force. It's also capable of transporting litters of the injured, and ambulatory patients. The fuel in the 136-foot-long KC-135 is pumped through the "flying boom" by the boom operator during flight in order to refuel aircraft. The planes can fly at speeds of 530 miles per hour at 30,000 feet, and can carry a transfer fuel load of 200,000 pounds. The basic airframe was built and designed in the 1950s. It has the body of a Boeing 707. The four turbofan engines are mounted under 35-degree swept wings. The planes can carry up to 83,000 pounds of cargo. The first KC-135 flew in August 1956, according to the Air Force, and the last KC-135 was delivered to the Air Force in 1965. A majority of the 732 KC-135s built were modified with new engines, enabling the planes to offload 50 percent more fuel and be 25 percent more fuel-efficient. Additionally, KC-135s continue to upgrade communications, navigation, autopilot and surveillance equipment to meet the needs of the Air Force. After emerging contaminants were discovered in wells at Fairchild Air Force Base earlier this year, base officials started testing residential wells in the area for the chemicals, most commonly called PFOA and PFOS. For 40 years the chemicals were used in firefighting foam on the base and others around the country, which are all systematically being checked for contamination. In early phases of testing, both residents near the base and thousands who get water from the city of Airway Heights were told to only drink bottled water after their wells tested higher than recommended health levels. After flushing city wells with Spokane water, Airway Heights is back to using its water for drinking. Meanwhile, residents whose private wells were contaminated are waiting to see what long-term options they have, which could include filtration. In the latest phase of testing that started near Fairchild on July 10, officials have tested 50 residential wells just north of the base off Highway 2 and south of the base near Highway 902. Preliminary results of those tests are expected back this week. 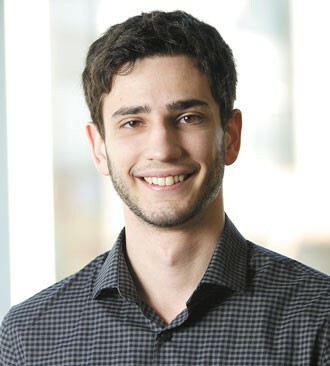 ABOUT THE AUTHOR: WILSON CRISCIONE, born and raised in Spokane, is an Inlander staff writer who covers education and county government. His work previously appeared in publications including the Spokesman-Review, and before joining the Inlander in 2016 he wrote about education and crime for the Bellingham Herald. Contact him at wilsonc@inlander.com or 509-3205-0634 ext. 282.